Envisioning a better RVA for childbearing families. - nurture. Last month Nurture hosted our first Cross Sector Community Conversation for Maternal Health, part of a series we’re planning over the next year. Three midwives, a public health nurse, a community health worker, a manager of obgyn services at a free clinic, a WIC peer counselor, a representative of a Richmond Doulas, Nurture two board members attended. 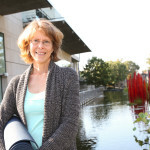 The Community Conversations are both a part of Nurture’s strategic plan and a component of my social justice project for the Pat Asch Fellowship I received earlier this year. Our goal with these conversations is to bring together stakeholders from various sectors to begin to identify gaps, needs, and resources in RVA for women’s reproductive wellbeing. To start a dialogue that we hope, over time, will lead to a shared vision for how childbearing families could be supported n our community if our various stakeholders are all walking and talking and listening on this path together . Shared vision takes a long time to develop. We had just two hours. During that time we needed to share a meal, get to know one another, and start to explore the various terrains surrounding the people having babies in our community. In essence this first conversation was about casting some seeds onto the soil to see what might emerge. 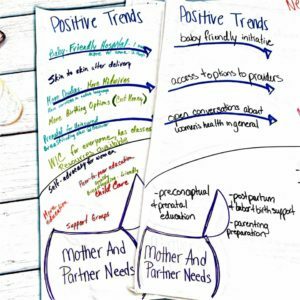 In small groups, the participants began to chart RVA’s maternal health landscape, talking about positive trends, negative trends, the needs of moms and partners, and barriers and uncertainties that keep these needs from being met. As each group outlined the map they had created, my heart began to get heavy. 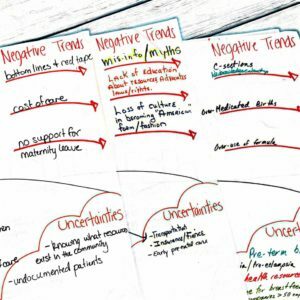 Even though we began with the positive trends, the barriers, the negative trends are big: a disconnect between resources and those that need them, lack of culturally appropriate support, lack of paid family leave, institutional red tape, high cost of care, and a favoring of profit over outcomes. The WIC Peer Counselor relayed a story of a mother and newborn going home from the hospital by city bus less than 48 hours after birth, how she worried about that newborn’s immune system being exposed to so much on that journey. Every time I look hard at the landscape surrounding pregnancy and postpartum, I feel deeply disturbed at the lack of support for such a critically important life transition. Why do childbearing families, and the care providers who serve them, have such a difficult time accessing the resources needed for good outcomes? 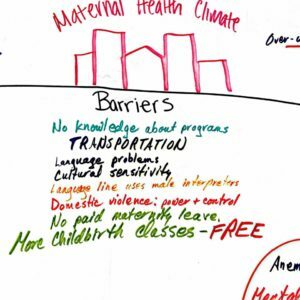 How do we create a coordinated, connected network that addresses the needs of pregnant and postpartum people and their families in an equitable, sensitive manner? How do you begin at the beginning? You kick up a lot of dirt. How do you begin at the beginning? You kick up a lot of dirt. 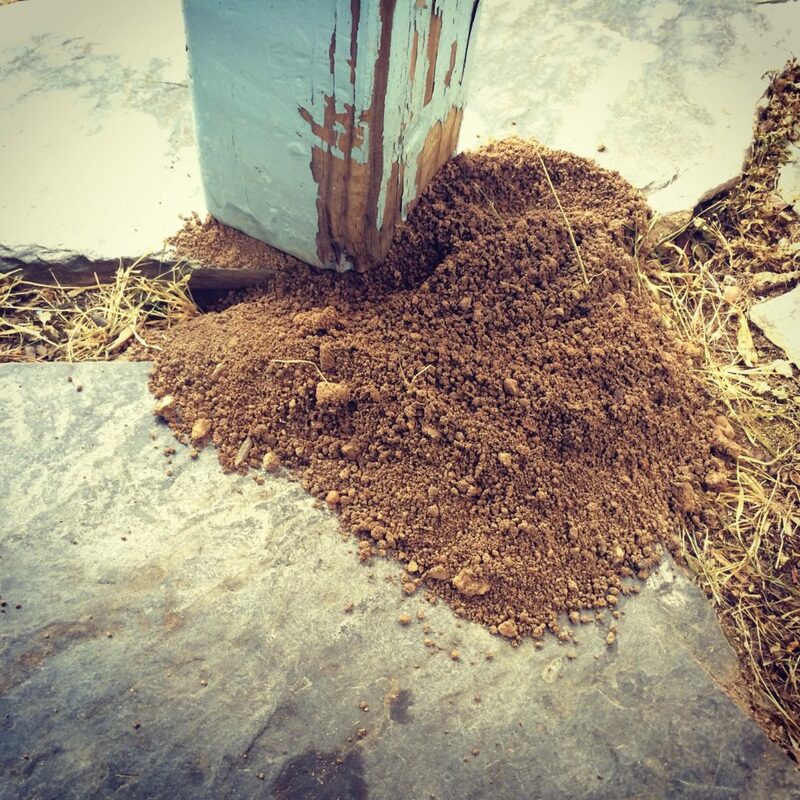 As I write this piece, I sit at a picnic table in my backyard, where beneath my feet a digger wasp has been crafting a home for her babies. Seemingly impossible work, she has dug a hole in a tiny gap between two pieces of slate to shelter her young, turning compacted dirt into a mountain of loose soil. Twice she showed up carrying big juicy cicadas – loads bigger than she was – and hauled them down into the dark earth, sending crumbs of earth flying as she labored. Carrying a heavy load and diligently, carefully constructing a place of safety for the process of reproduction to unfold. The wasp gave me hope that we can do the same for our own hive, though the work may seem impossible at times. 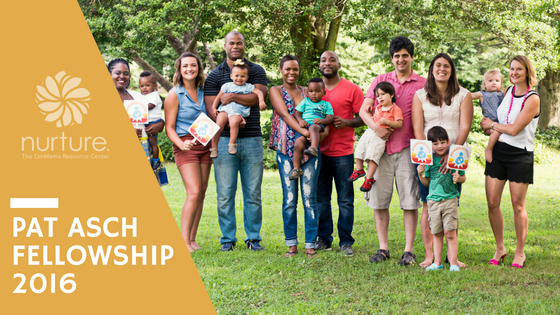 May these conversations lead to small, persistent steps towards connection and progress for childbearing families in RVA. Over the next year, Nurture will host a series of Cross-Sector Conversations for Maternal Health, bringing together mothers, partners, professionals from various sectors to explore how we can create a better network for Richmond’s emerging families. If you’d like to join the conversation, email us at info@NurtureRVA.org.